HOME .. ROCK MUSIC .. MUSIC ARTICLES .. MUSIC NEWS ..
Jack White pulls his black Ford pickup truck to the curb on a quiet, tree-lined street in his native Detroit and hits the 'play' button on the CD player in the cherry-red dashboard. He turns the volume up to deafening and grins proudly as howitzer-fire drumming and squeals of distorted guitar rattle the windshield. There are bursts of marimba, too, which sound like someone shaking a bag of bones. The singing is really just shouting, and the lyrics are kid stuff: "You're my top special, baby/Top! Top!" But the total effect is elementary, irresistible ecstasy. Jack is playing "Top Special," a new White Stripes track recorded a week earlier with drummer Meg White -- who is sitting quietly in the back seat -- for a special Japanese single. The chorus, Jack says over the din, is a phrase popular with Japanese teens: "It basically means 'You're my best friend.'" There is no better way to describe the White Stripes themselves. A few days later they perform "Top Special" for an adoring audience at Keller Auditorium in Portland, Oregon, the fifth stop on their current U.S. tour, promoting the Top Five album Get Behind Me Satan. But Jack and Meg are playing to each other. He stands at a mike set at the foot of her kit, his eyes pinned on her as he sings and thrashes his guitar. She looks up at him with the same undivided attention as she keeps steady, thundering time. It is a perfect picture of a remarkable bond. Publicly, Jack and Meg, both thirty, claim to be brother and sister, even though a Detroit newspaper blew their cover a couple of years ago, revealing them to be ex-husband and -wife (married in 1996, divorced in 2000). But on their five albums as the White Stripes, and especially onstage, there is no mistaking the truth of their relationship. They make music like inseparable kindred spirits. "It will always be us two," Jack says of the Stripes over lunch that day in Detroit. "I will never do the White Stripes with another drummer. She'll never do it with another guitarist." The White Stripes are at a commercial and creative peak. Satan is their third hit album in a row, following the 2001 breakthrough White Blood Cells and 2003's Elephant. Satan is also their boldest record, combining the Stripes' whiplash rock and Jack's passion for vintage blues and country music with a gothic-roadhouse tension scored with grand piano and marimba. "There is an authenticity about everything Jack does," says T Bone Burnett, who produced Jack's solo tracks on the soundtrack to the 2003 film Cold Mountain. "I don't know many people under thirty who have done the research Jack has done -- and can do a credible Blind Willie McTell cover." 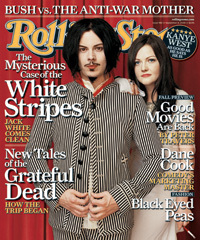 The White Stripes are, in most ways, Jack's creation. He writes the songs, plays everything except drums and devised the band's peppermint-stripe color scheme. And he does almost all the talking. "I'm just a very shy person," Meg confesses at lunch, although she defends the primal quality of her drumming with sweet firmness. "That is my strength. A lot of drummers would feel weird about being that simplistic." Born John Gillis in 1975, Jack (who took Meg's surname when they married) actually started out as a drummer, at age five. But music was not his first career choice. In high school, Jack, a Catholic, seriously thought of entering the priesthood. After graduating, he considered joining the Marines but instead worked as an upholsterer and, for a time, as a gofer on TV car-commercial shoots. "I could see that it was impossible to get your ideas across, with all the people -- the soundman, lighting people, producers -- you had to go through," he says. "I suppose that put me in the direction of a two-piece band." Jack played drums and guitar in several Detroit garage bands (Two Part Resin, the Go, Goober and the Peas, the Hentchmen) before he and Meg, another Detroit native, made their local live debut in 1997. Jack soon found that underground cool came at a price. "We were everybody's secret band," he says. "Then our second album [De Stijl] came out, and it was 'Oh, they're not that good anymore.' When we hit the mainstream, I had to go through that game all over again, on a worldwide scale." Jack may be a reluctant star, but he is a fireball in conversation. He speaks at high speed, his brown eyes looking directly at you like derringer barrels, and his laugh is a series of short, sharp bangs, like a string of firecrackers going off. For more than three hours, over two sessions, he goes into excited detail about, among other things, the Captain Beefheart and Gun Club records that blew his teenage mind, the album he produced for his idol Loretta Lynn (2004's Van Lear Rose) and the record he's finishing with his new band, the Raconteurs, formed with fellow Detroit rocker Brendan Benson. "I've got enough time," Jack says cheerfully of having two groups at once. "I don't have a day job anymore." And Meg claims she is not worried about the effect on the White Stripes' future. "Jack's always done five things at once," she says. "He was in two other bands when we started this one. This is not unusual." © Copyright 2019 Themayfieldfour.com. All rights reserved.